Cordless drills are a vital tool at the construction site. At-home projects are also made simple with the use of a drill, and it’s one of those tools that will cut down the time a job takes dramatically. The right drill will last you years, and it will be just the right weight and balance to allow for use even on the toughest jobs. Speed Options: The speed at which your drill operates is important. Variable speeds are ideal, as they allow you to drill slowly through thicker woods and faster through surfaces that are drilled through easily. Variable speeds allow for a wide range of drilling options. Weight: A drill’s weight needs to be heavy enough to allow for good leverage, but light enough to ensure that you don’t become too fatigued during the drilling process. If you plan on doing heavy drilling jobs, you’ll want a unit that is lighter to lessen the overall fatigue experienced when on-the-job. Torque: Some drills do include their torque rating, and this is vital when choosing a drill for heavy-duty jobs. Torque is a measurement of force that the drill will use to turn an object, in most cases a drill bit. This is not to be confused with speed. Keep these features and specifications in mind when reading through our reviews and trying to find a drill that is ideal for your needs. It’s not uncommon to own several drills for different jobs – keep that in mind, too. 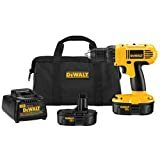 DEWALT DC970K-2 18-Volt Compact Drill Review – Dewalt’s DC970K-2 is a drill and driver kit. This model features a dual speed range of up to 450 rpm and up to 1,500 rpm. Designed to offer optimal performance, this model includes two batteries, and recharges in one hour (charger included). Lightweight, this drill weighs just 5.2 pounds to reduce user fatigue. 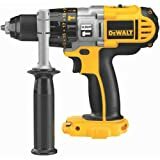 A 380-unit watt motor offers the utmost in power, and a 1/2” drill driver is featured that allows users to get into tight spaces. There is a contractor bag included, too, which allows for easy transport from one job to the next. This model is cordless, and is an all-around solid drill that is perfect for most non-heavy-duty jobs. Makita XPH012 18V LXT Review – The best cordless tools are versatile, and the XPH012 is just that. This model offers a 1/2” hammer driver-drill kit and weighs just 4.0 pounds, which is exceptional for larger jobs. 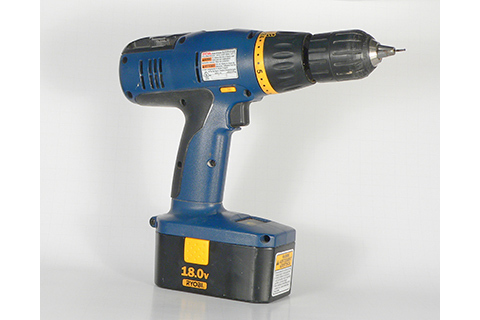 The cordless drill torque on this model reaches 480 in. lbs. thanks to the 4-pole motor. Speeds can be changed between 0-400 rpm and 0-1,500 rpm for driving, drilling and hammer drilling options. The drill is just 8-1/8” in length, and there is one battery included. A built-in LED light will illuminate your drilling area to offer precision drilling even in low-light conditions. Charging takes just 30 minutes, making this a great drill for longer jobs. Hitachi DS18DSAL 18-Volt Lithium Ion Compact Pro Review – The Hitachi DS18DSAL is a compact drill driver that comes with a flashlight, which will illuminate your workspace. This model can produce 460 in. lbs. of torque power to be able to work in even heavy-duty scenarios. There are 22 drive settings as well, and one drill mode. Variable speeds allow for maximum drilling control, and the unit can accept 1/2” ratcheting keyless chuck, allowing for a wide range of bits to be used. A metal belt hook allows the unit to be transported quickly around the job site, and two 1.5Ah lithium ion batteries are included. This unit weighs 12.2 pounds. Ryobi P271 18 Volt 1/2 in. 2-Speed Drill-Driver Review – The Ryobi P271 is a bare tool, so it’s low-priced, but it doesn’t come with a battery or charger, which is something to consider. Anyone who has a battery and charger available will find that this is an affordable drill that has a 1/2” single-sleeve, keyless chuck. There is an automatic spindle to lock bits in place and allow for easy changes. A 24-position clutch and two speeds allow you to control the speed to match your drilling and driving needs. The magnetic holder allows for easy placement of bits and screws, and there is a bubble level on top of the drill to allow for accurate drilling. This is a great bare tool to use as a replacement. DEWALT Bare-Tool DCD950B Review – The Dewalt DCD950B is another bare-tool that offers a three-speed transmission, which allows for improved performance and run time. This unit has a 1/2” self-tightening chuck, and there is an LED work light that allows for increased visibility. The motor can produce 450-watt of power, and there are 22 clutch settings. The drill weighs 3.9 pounds without the battery included, and users will need to purchase XPR batteries, as this is a bare-tool. The unit’s speeds are 0 – 500, 0 – 1,250 and 0 – 2,000 rpm. The DCD950B also comes with a 360-degree side handle and has a three-year limited warranty. This is a cordless drill meant for serious jobs. These five models give you plenty of options, and you probably have a few lingering questions after reading our reviews. We know just how difficult it can be to choose a drill that is perfect. We’ve included some of the most common concerns and key points that can help you find a drill that meets your needs. Bare vs. Kits: A bare tool is more affordable, but these models will lack some extra features, such as a battery or charger. For this reason, base tools are ideal replacement tools. A kit is the right choice if this is your first cordless drill because it will allow you to have everything needed to get started on a project without any further expenses. Batteries: Lithium ion batteries are among the best in the industry, and there are several battery types you’ll find among different drills. You’ll also want to decide whether you want a unit that includes batteries or a bare tool. A lot of units will include two batteries, and this is a good option if you plan on undertaking larger jobs that will need continual drilling. Lighting: Longer jobs and projects can drag on into the night, which means you’ll need lighting to ensure precision drilling. A drill with a built-in LED light is a good choice for those jobs when light may be limited. Built-in Level: A built-in level will allow you to make precision holes that are always level. Some units do include these levels, and for long and intense jobs, these levels can reduce the amount of mishaps along the way.